Archives of Eaton Bray News for March 2012. This article was published in March 2012. Please see Latest News for more recent information. Policing in Bedfordshire is entering a new era and this newsletter also aims to keep the public and our partners up to date with the latest developments on the transition to Police and Crime Commissioners. Last month, Bedfordshire Police Authority voted to increase the portion of council tax residents pay towards policing next year by 3.95%. The decision was taken to reduce further cuts to the front line and to provide the Force with the capacity to meet future challenges. The increase means households will pay an extra £5.72 a year for the average Band D property (11p per week). The Authority decided against accepting the Government's offer of a one-off grant on the basis that this would have brought funding shortfalls in the future and inevitably resulted in more cuts to Police Officer and staff posts in the next two years. Although some Police Officer posts must still be lost as the Authority tries to identify £5.6m of savings this year, the additional income from council tax will provide greater financial security in the future. Feedback gathered during consultation events suggested the majority of residents supported a small rise in council tax to strengthen local policing. In our online budget survey, 65% said they would prefer to see performance safeguarded through a precept increase. The total budget for the Force next year was agreed at £100.637m. We recognise the difficulties that economic pressures are having on our hardworking families however this decision has been taken with their safety in mind and will ensure we can respond when needed. The four main performance goals developed by Police Authority members and the public in 2010 continue to form the basis of the plan. These are: protection of life, protection from violence, protection of property and protection from disorder. These goals will drive all areas of policing, even those services which are carried out on a collaborative basis with other Police Forces. The overall aim for each will be to drive down offences and improve detection rates as well as increase the satisfaction of victims. Anti-social behaviour remains a key priority for the Force but it is not just a police issue. Tackling it requires a holistic approach so we work closely with other organisations including criminal justice agencies, local councils and the voluntary community sector to address problem areas. We are aware of the need to improve the satisfaction of those who have to use police services because they are victims of crime. This year the police will put in place new systems to make sure victims receive regular contact, detailed updates and increased service quality. In the foreseeable future the forthcoming Police and Crime Commissioner will take over the mantle and become the victims' champion, and will engage the full range of local services to address key issues. During the next four years, Bedfordshire's police service also aims to deliver further value for money for council taxpayers. We are already heavily involved in collaborative work which has reduced costs considerably and improved resilience. We will continue to deliver large savings by radically changing how our support functions (human resources, finance and training) are organised and by cutting our spending on goods and services. We would like to thank those partners who contributed to the consultation which shaped the 2012-16 Strategic Plan and to the public whose feedback informed the priorities set. Arrangements are already well underway in Bedfordshire to lay down the foundations for the new Police and Crime Commissioner, who will replace the Police Authority from November 2012. The PCC will fulfil an important role for the public, not only ensuring the Force operates efficiently and effectively but also by holding the Chief Constable to account. The Police Authority and the Force's Chief Officer Team are working hard to ensure all the necessary preparations are made for the PCC to take up their post. Our aim is to create a smooth transition to the new structure to avoid any impact on performance which is one reason why members have voted to increase the council tax precept to provide a stable financial platform. A number of workshop events have taken place across England and Wales to help local police representatives and partner organisations prepare for the PCC. In addition, the Government is expected to announce secondary legislation later this month which will give further guidance on the implementation of Police and Crime Panels. Police and Crime Panels (PCPs) are a key feature in the new system, formed to hold the Commissioner to account on behalf of the public and provide a "check and balance" role. The legislation is expected to cover the duties of PCPs such as its power of veto over various issues including the Commissioner's proposed precept and the Chief Constable's appointment process. It will also set out regulations for the process of nomination and the appointment of local authority members on PCPs. Two co-opted Members will also be appointed by the Councillor members of the Panel. The Panel may co-opt additional members including extra councillors provided the Panel does not exceed 20 members and the Home Secretary agrees to the increased size of the Panel. Bedford Borough will host Bedfordshire's Police and Crime Panel. Bedfordshire is in the process of finalising its PCC information packs which will be helpful to anyone considering applying for the role of the PCC. More information can be found on the dedicated section of our website http://www.bedfordshirepoliceauthority.co.uk/PCC-&-Police-Reform.html and the Home Office has also published an information booklet for potential candidates available at: www.homeoffice.gov.uk/publications/police/pcc/have-got-what-takes/got-what-it-takes. Residents will be able to vote for Bedfordshire's first PCC on November 15 2012. More information on the election process is due to be announced by the Home Office later in April. The elections will use the supplementary voting system which is currently used to elect mayors, the closest existing role to PCCs. Under this system, voters are asked to indicate first and second preferences. Candidates are elected if they gain more than 50% of the first preference votes. If not, all but the top two candidates are eliminated and the second preferences from everyone who voted for an eliminated candidate are added to the totals of the top two candidates. The candidate who receives the most votes wins and becomes the Police and Crime Commissioner. The idea of this system is that it encourages conciliatory campaigning, as candidates will still want the second preference votes from residents whose first choice is for another candidate. Bedfordshire Police Authority prides itself on listening to the public and understanding their needs and has welcomed new performance figures which show the Force is meeting its promises to address the crimes which matter most to them. Burglary was identified as a top priority for residents throughout 2011 and was listed as such in the Strategic Plan. Figures now show the action taken to address this crime has resulted in two fewer burglary offences per day over the last year (from 10.7 per day in 2010 to 8.7 between April 2011 and March 2012). Meanwhile, police are also solving a greater number of burglary offences, from 16% in 2010/11 to 21% in 2011/12. The picture is equally as positive for overall crime, with almost five fewer offences being recorded per day during the same period (meaning 2,800 fewer victims). Bedfordshire Police has also maintained its improved national rank positions in all of its priority detection categories compared to last year which means our communities are not only safer, they are also receiving a better service in the investigation and detection of the crimes. By continuing to address the issues and concerns of the public and driving down crime rates, confidence in local policing will improve and more people will be satisfied with our service. It is possible that there may be an English Defence League event in Luton in May. The Force is seeking legal advice around all of the issues associated with any march or demonstration particularly knowing the impact this type of event has on the community, both socially and in terms of financial loss. Bedfordshire Police are very aware of the fear and concern people have based on the community impact assessments already carried out. They are making it a priority to talk to and seek opinions from everyone affected by the proposed event and they are in daily contact with Luton Borough Council, community and faith leaders. The Force is keen to reassure the residents of Bedfordshire that whatever course of action is taken by the police it will be firm, fair, focussed and effective on the day. Bring you own glasses and drink, 7.00pm for 7.30pm, Just £9 per person, Teams of up to 8 people, Fabulous prizes! The next Parish Council meeting will be on Monday 2nd April 2012, 7.30pm, in the Coffee Tavern. 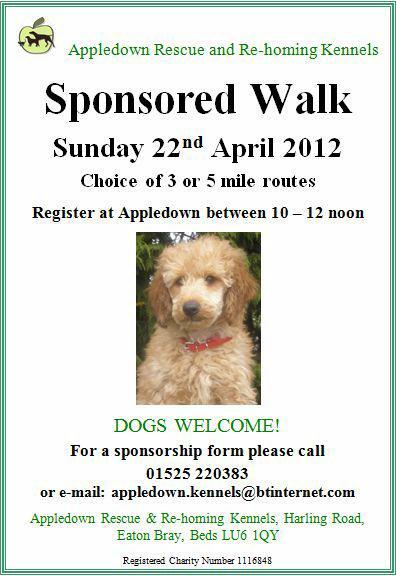 Register at Appledown between 10 – 12 noon. DOGS WELCOME! You are viewing the March 2012 archive.